There have been rumblings recently about the return of the bias-cut dress. My favourite examples of this style come from the time of its invention, the 1930s. Old Wallis Simpson's Mainbocher wedding dress is undoubtedly the queen (oh...) of the genre. Another wedding dress, however, one that was worn nearly fifty years after Ed and Wally did the deed, is a strong contender for the most beautiful bias-cut dress. It is the Narciso Rodriguez gown worn by Carolyn Bessette when she married John F. Kennedy, Jr. In August 2003 Vanity Fair published an excerpt from Edward Klein's pretty trashy-sounding, The Kennedy Curse: Why Tragedy Has Haunted America’s First Family for 150 Years. Klein details how the Rodriguez dress did not include a zipper (!) and that on the day, horror of horrors, Carolyn found herself unable to put the thing on. 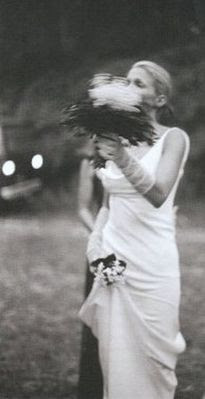 It was only after Gordon Henderson, a friend and designer (who, incidentally, had been crushed by Carolyn's decision to not go with one of his own creations), put a scarf over her head, that they were able to slide the dress onto the 'hysterical' bride. Has ever a bride looked so lovely? I met him in the ocean.